In the French zone of the country, ten were baptized in Jesus' name and six more were to be baptized the following week. This took place after teaching was made on how the name of Jesus has all power and everything in word or deed is to be done in that name. One of the ladies who was baptized gave testimony of being pregnant for five months and not feeling the baby move. When she came out of the water she felt her child move and has continued to move ever since. There were sixty in attendance and two baptized in Jesus' name at the newest work in the French zone. In the north, sixteen received the Holy Ghost and nine were baptized in Jesus' name. Faculty Education had twenty-nine in attendance. At a recent crusade, seventy-nine received the Holy Ghost and seven were baptized in Jesus' name. Thirty-five received the Holy Ghost during National Youth Convention. Forty-three were baptized in Jesus' name and forty-four were filled with the Holy Ghost. Seven new ministers received license at a recent ministers seminar. The Bible school has a record enrollment of forty-eight students. There are twenty-three in first year. One fellowship has asked for their ministers to be trained. They sent five students. In one major city, thirteen were baptized in Jesus' name. In three days, seventeen were filled with the Holy Spirit. While traveling to a seminar, the missionary and his daughter experienced the protecting hand of God as they escaped an accident by mere inches. The missionary was attempting to park his truck at the church as a taxi was in the oncoming lane. He quickly moved to the shoulder and parked. After walking to the back of the truck to retrieve his briefcase, he saw a large drain hole about three feet deep. The left side of the truck was almost completely off the road and in that hole. The neighborhood was completely in shock at the fact that he had driven over the hole and did not fall in. At General Conference, thirty-one received the Holy Ghost and thirty-eight were baptized in Jesus' name. Six of those baptized were pastors of churches who have joined the UPCI. One of these pastors has started a new church. Since the Conference, three pastors from very different areas of the country=2 0have been baptized. Many miracles have occurred in the last three to four weeks. 1) One six year old girl was raised from death as they were preparing her funeral. 2) A pastor's wife, of a church in the capital city, was raised from her death bed due to AIDS and God healed her. She attends the UPC church. Jesus hears the prayers of these people. 3) Pastors with differences of opinion have made amends. 1) Sixty-eight received the Holy Ghost and sixty-two were baptized in Jesus' name. 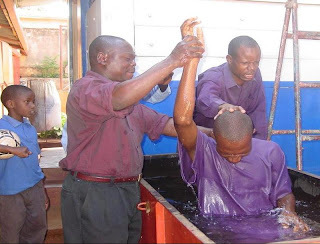 2) Two trinitarian pastors were baptized in Jesus' name and received the Holy Ghost. 3) Two more pastors were baptized and now work with the UPCI. 4) Five new churches were started. Over 200 attended 'Big Sunday' services and nine received the Holy Ghost. A total of sixty-eight received the Holy Ghost at two revival meetings. Jim & Karen Crumpacker Jim and Karen Crumpacker gained their first foreign missionary experience as Associates In Missions to Kenya in 1982. They received full missionary appointment in October 1984. As the field superintendent of the UPC of Malawi, Brother Crumpacker oversaw the church structure, pastors, training ministers, and supervising the building of country churches. In his additional role as a missionary to Mozambique, Brother Crumpacker made periodic trips to help the developing church in a nation still recovering from years of civil war. In 2003, the Crumpackers returned to Kenya leaving behind their beloved Malawi. In Kenya, Bro. Crumpacker holds the position of Missionary Director, serves on the National Board, and assists the Kenyan church in training and evangelism. Bro. Crumpacker also serves as Area Coordinator over the thirteen countries of East Africa. Five of these nations have resident missionaries and eight do not. The Crumpackers have one son, Jason and daughter-in-law, Jill, who served as AIMers in Greece for some time. As an adult, Jason has returned to Africa twice, for ten month increments on AIM assignments, helping with building projects and to teach in the Bible School. 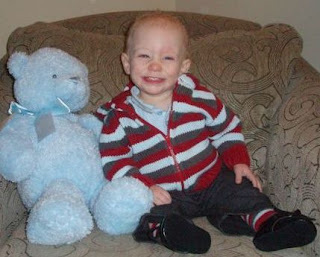 Jason and Jill now live in Indiana, USA and are proud parents of a precious boy named Orrin. Of course, Pop and Nana Crumpacker are proud of him too.